Champion “Classic & Muscle” Motors Oils are on display at this year’s SEMA New Product Showcase and exhibited at booth #21131 at the Las Vegas Convention Center. 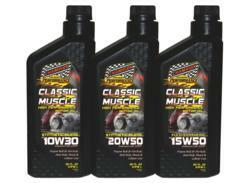 These top-tier performance motor oils are purpose-build for vintage, classic, hot rod and muscle cars that need more protection than current API specification motor oils can provide. To meet these demands, Champion utilizes its premium ZDDP anti-wear protection package, which contains a unique balance of chemistry that includes high levels of zinc and phosphorus. In addition, all Champion “Classic & Muscle” Motor Oils contain an exclusive TVS® (Thermal Viscosity Stabilizer) technology. This proprietary technology delivers unmatched film strength at high temperature, better piston ring seal for maximum compression, and increases horsepower and torque in most engines. Champion’s three new performance motor oils also contain special lubricity modifiers to reduce friction, and unlock the full potential of any engine.